The term “BID,” or business improvement district, shifted into focus over the past year and a half as business owners and community members from Roosevelt Row set out to create one, recently gaining approval by the Phoenix City Council on Jan. 20. So what exactly does this mean for the future of Roosevelt Row? In order to answer that question, it’s important to understand what a BID is, and more importantly, why business and property owners wanted one in the first place. Under state law, a BID can provide a host of enhanced public services like safety, fire protection, trash collection, street or sidewalk cleaning, landscaping, event planning, marketing, transportation and public parking. The services are paid for by property owners within the district through a special assessment on their property tax bill. The whole “paying more taxes” thing can sometimes be a tough sell, but according to David Krietor, president and CEO of Downtown Phoenix Inc. (DPI), a BID is one of the most effective urban redevelopment tools out there. “It creates a place to establish the vision of a downtown or city center and run the programs that drive that vision — all managed and governed at the neighborhood level,” he said. The acronym “BID” may not be commonplace, but it’s also a relatively new concept. The first improvement district was developed in 1970. According to a report by Rutgers University, there are now more than 1,500 in North American cities. As a testament to their growing popularity, new BIDS are created all the time (including Mexico’s first in 2015) and virtually no BIDs have failed, according to the International Downtown Association. A prime success story is located just south of Roosevelt Row. 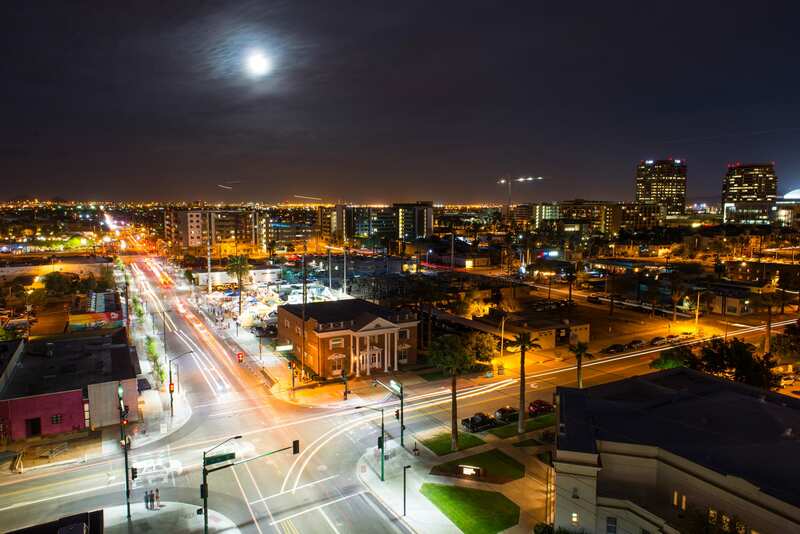 Phoenix’s first BID, the Downtown Phoenix Partnership and its affiliates, now collectively known as DPI, operate a business improvement district with boundaries from Fillmore Street to the railroad tracks, Seventh Street to Third Avenue. Often referred to by different names in different cities, including business improvement area (BIA), business revitalization zone (BRZ), community improvement district (CID), enhanced municipal services district (EMSD) and others, the goal is always pretty much the same. “A local business community comes together, looking for ways to provide additional services for themselves and their neighbors — over and above what is provided by the government — and they’re willing to pay for it,” said David Roderique, executive vice president of DPI. To see what a BID is capable of, all you need to do is take a walk down memory lane, and you don’t even have to go that far. Partially due to a national wave of suburbanization, the cultural and economic shift of the late ‘60s through the early ‘80s caused Downtown Phoenix to fall into a deep decline, according to Krietor. It hit Phoenix particularly hard because unlike other major cities, it didn’t have a well-established, urban downtown. The story of how Downtown Phoenix transformed from a ghost town into a vibrant, culturally rich area is a nuanced and complex one. There are countless business leaders, community advocates and neighborhood groups to thank for its revitalization. But the short answer involves specific economic catalysts that really helped get things moving. During the 1990s, downtown’s historic neighborhoods acted as a stabilizing force, in addition to significant investments in America West Arena, the Phoenix Convention Center and performing arts centers like Symphony Hall and Herberger Theater. These investments helped show people what was possible, according to Krietor, and what downtown could be. The Downtown Phoenix Partnership was established in 1991 and American West Arena (now Talking Stick Resort Arena) opened a year later, bringing thousands of people to downtown annually. Starting with about $500,000, a small, private security team and a handful of staff members, the partnership initially focused on keeping downtown clean and safe. As downtown changed, so did the partnership. Now garnering nearly a $4 million annual budget, that small security service morphed into a full-scale Field Services Team with in-house personal concierge service (ambassadors), streetscape and landscape. 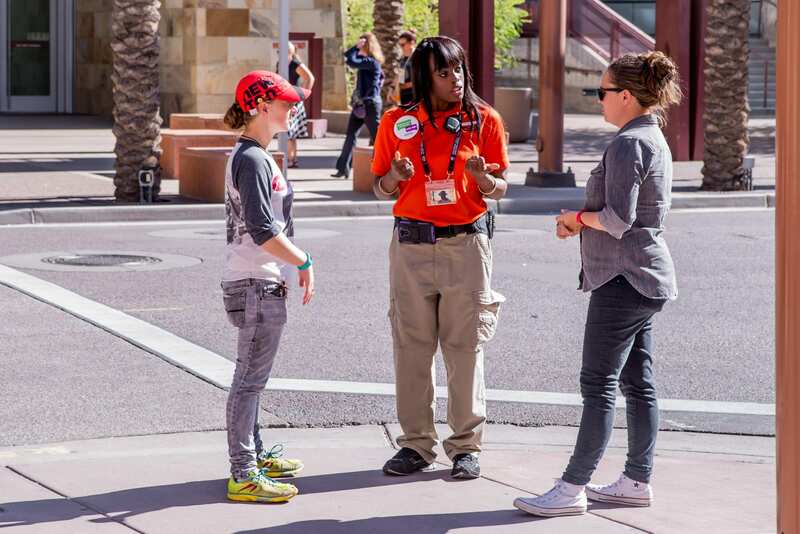 Collectively in 2015, the Downtown Phoenix Ambassadors and Streetscape Team removed more than 34,000 pounds of trash from public areas, led more than 1,800 walking tours, helped more than 18,000 people find a restaurant, gave out thousands of maps, planted dozens of trees, helped the homeless, jumped people’s cars and the list goes on and on. While the smiling faces of the Downtown Phoenix Ambassadors have become the most celebrated aspect of DPI, the ever-growing events department (think Zombie Walk, Urban Ale Trail, Urban Wine Walk and PJs In the Park) helped bring more than 200,000 people to the Urban Core last year alone. With the approval to form a new Roosevelt Row Business Improvement District — and the increased tax that would come with it — planning and promoting events, supporting public art and implementing safety initiatives is positioned to become a whole lot easier for the people currently volunteering their time to do it. Community builders like Kimber Lanning of Local First Arizona, Wayne Rainey of MonOrchid, Roosevelt Row CDC co-founder Greg Esser, Cindy Dach of Made Art Boutique, Carla Wade Logan of Carly’s Bistro and Evans Churchill Community Association president Kevin Rille (among others) contributed to the Roosevelt Row BID vision. Led by Nancy Hormann of Hormann and Associates, the group proposed an annual budget of aproximately $375,000 that would prioritize things like safety initiatives, streetscape and public art. The beloved First and Third Friday art walks, Chile Pepper Festival, Pie Social and many other community events didn’t just form out of a vacuum. 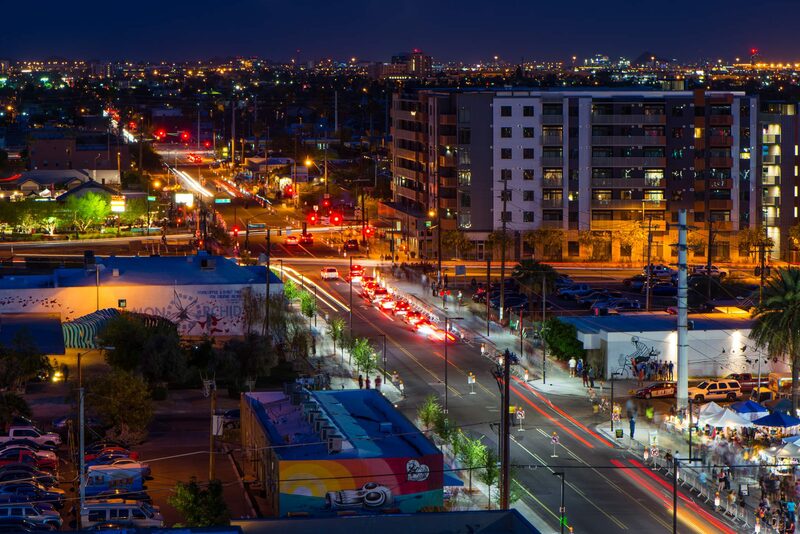 Over the span of decades, it took countless volunteers and the personal investments of many to create Phoenix’s first “Great Place,” a designation awarded to Roosevelt Row by the American Planning Association in 2015 for exceptional neighborhoods, streets and public spaces. With a majority of Roosevelt Row property owners in accord and with approval by the city — the next step is to establish a board (made up of property owners) that will then create and recommend a budget to be approved by City Council.